In any elementary reading classroom, helping students to comprehend what they read is always at the forefront of the reading teacher's mind. Explicitly teaching reading strategies and skills, teacher modeling, collaborative use, and guided practice are all key components of good teaching practices, but what can teachers do once these steps have been taken to insure that students have opportunities to independently use and practice reading strategies and insure that students are comprehending? 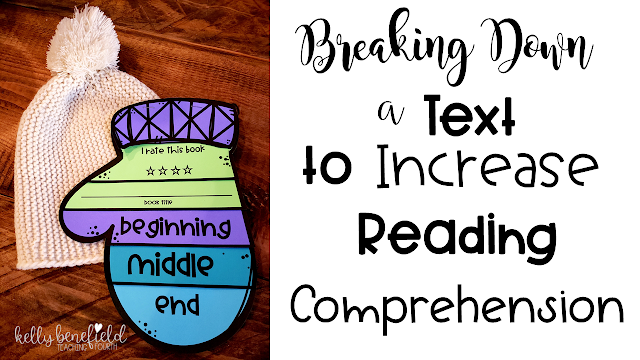 Allowing students to break down a text, can be an excellent way for students to show their understanding of the text and improve comprehension. 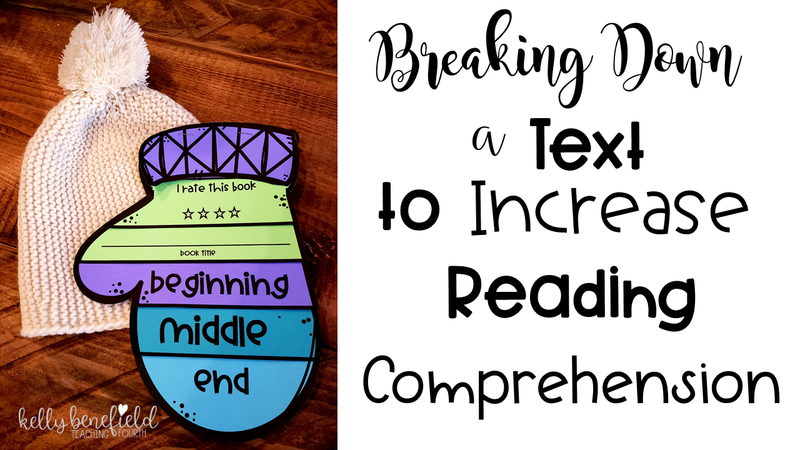 Breaking down a text can help increase reading comprehension. 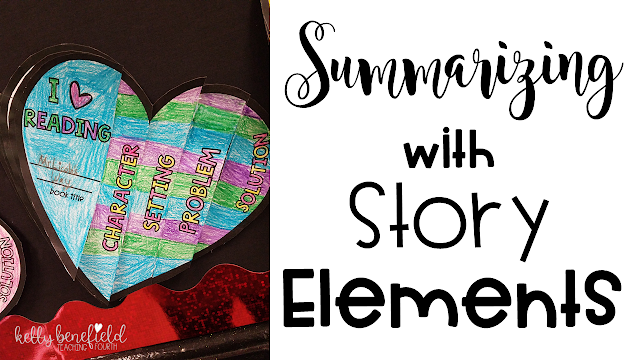 This strategy includes looking closely at, identifying, and writing about elements such as: character, setting, problem, solution, beginning, middle, end, summary, facts, etc. Finding a tool to help students break down a text can help students enhance their understanding of what they are reading. Finding a tool that not only helps students break down the text but is also fun is a win-win. Winter Mittens Flipbooks not only are fun and motivating for students, but they are designed to help students break down the text (both fiction and nonfiction) in order for them to dig into comprehending. These flipbooks are highly engaging for students and are a very effective way for students to think about and write about what they have read. Use these flipbooks in a variety of ways in your classroom. Use with independent reading, literature circles, classroom novels, homework, book reports, and more. Best of all, your students will love them! Included in this Winter Mittens Flipbooks packet are three mitten flipbooks. Two fiction flipbooks and one nonfiction flipbook are included to help students break down what they have read. Students will write about the character of the book, describe the setting, explain the problem and the solution. By doing this, students are able to look closely at the text as well as summarize while explaining these story elements. This flipbook is perfect to help students summarize by breaking down the text into the beginning , middle , and the end. After reading nonfiction text, students can use this flipbook to write a summary of the text, list important facts, and identify text features found in the text. Once you choose the book that best meets the needs of your students, you may decide to display the completed mittens in the hallway or create an eye-catching bulletin board similar to the picture below. Letters for the bulletin board are included in the packet. Simply print on colored paper and cut out. Arrange the mittens around the board. Add your own snowflakes and white rope to create an eye-catching display. Your students will love seeing their work. 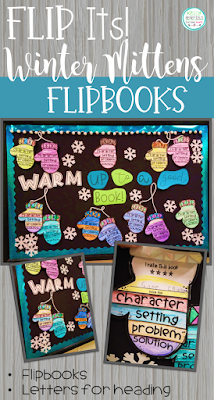 Simply click on any picture to purchase my Winter Mittens Flipbooks and have your students creating these fun winter flipbooks. Happy Reading! Have a blessed day!